Our “goal” is fun in Kidville Soccer! Classes take place in our state-of-the-art gym, which features a 3” thick foam-cushioned floor, perfect for indoor soccer. Our playful program focuses on the skills of confidence, dexterity, coordination, and endurance through the joy of the game. Everyone plays in this cooperative introduction to the world’s most popular sport! The next David Beckham and Mia Hamm may be found at Kidville. Girls and boys go beyond just blocks in Construction Junction. This advanced art program lets children learn how to plan, build, and construct their own 3-D art projects! Roads, towers, monuments, and pyramids are just a sample of the structures to be introduced, imagined, and created with wood, collage, cloth, clay, and more. My Masterpiece combines all the fun of My Big Messy Art Class, with some added technique and style for 3 year olds. This class utilizes instruments and materials that are suited to the dexterity and the fine motor skills of a 3-5 year old - pencils, paint brushes, safety scissors and more. Each week results in a new masterpiece inspired by classic artists - this class will have your refrigerator gallery ready for visitors! So many ways to play! Circle up as our musical teaching team engages eager toddlers through songs and stories, manipulative toys, gross motor play, art exploration and sensory play. As they sing, stomp, clap and wiggle and make their way through this predictable, structured routine, children gain confidence about transitions, all while having fun and making new friends. Add additional children to any single or double plan for $50 more per month. 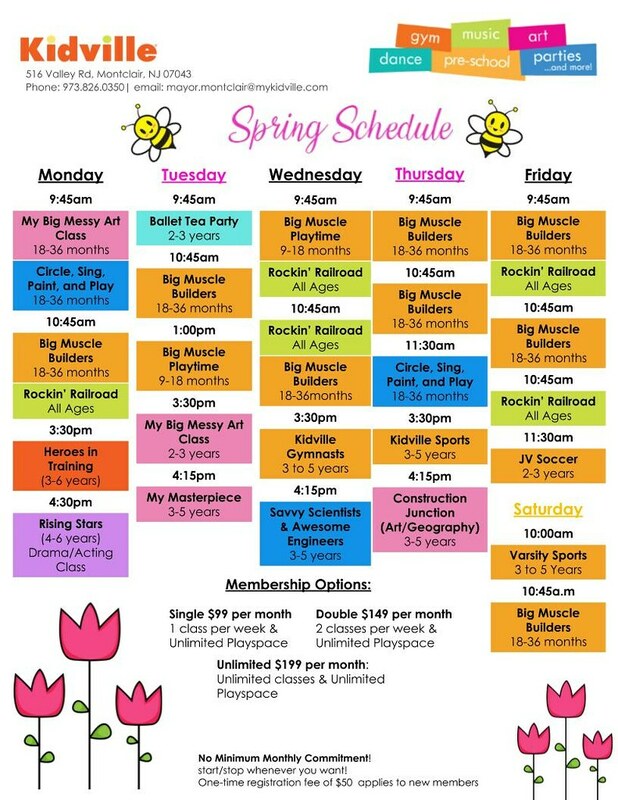 Call us about our playspace and unlimited membership options! TERMS & CONDITIONS: KVU Prep and Kidville University (KVU) excluded. Enrollment is for a minimum of four consecutive months and continuous until written notice is given prior to your next payment. Upon purchasing a class it is understood and agreed that Kidville will collect future payments by debiting the credit card provided. It is further agreed that Kidville has permission to make future monthly debits until notified in writing otherwise. The member agrees to keep their account up-to-date with a valid credit card. If additional costs are incurred by Kidville to collect payments referenced, those costs plus a $45 service charge will be applied. Scroll below for our NEW Winter 2019 Schedule!